Each year, the World Affairs Council of America (WACA) engages more than 4,000 high school students across the U.S. in quiz contests that test their knowledge of global issues and foreign policy in 10 categories. USIP partners with WACA to add a peace and conflict strand to the contest. The resources chosen to support this category enable students to learn about the overarching state of peacebuilding today, as well as also specific examples of how the work gets done. At the 2018 national competition, USIP focused on highlighting the practical ways in which conflict can be addressed without resorting to violence in its “Peacebuilding Toolkit” category. USIP once again served as the host of the opening reception. More than 200 students heard from Maria Stephan, director of the strategic nonviolence program at USIP, and had the chance to meet staff from across the Institute. The next day, students from Plano West Senior High School in Texas took first place in the competition; Palm Desert High School in California and Indian Hill High School in Ohio took second and third place, respectively. To learn about the other categories and a local competition near you, visit the WACA’s contest page. What concept is increasingly resonating in foreign policy circles because of its explanatory power for why and how interventions in fragile states must evolve? Per the 2017 Global Peace Index, how much can each dollar invested in peacebuilding reduce the cost of violent conflict? On the Spectrum of Peacebuilding Tools used by USIP’s Global Campus, which tools epitomize the concept of local ownership? Test your knowledge and answer the Peacebuilding Toolkit local competition questions below! Conflict is often viewed as something negative, associated with violence, war and destructive acts. However, conflict is a natural part of life, and it can be managed in ways that promote positive outcomes, even in the most difficult circumstances, if the right tools are put into practice. The Peacebuilding Toolkit covers core skills and concepts in the field of conflict resolution, as well as real-life stories of how individuals, communities and countries have used these skills to manage differences without violence and make peace possible. USIP was pleased to sponsor a peace and conflict-themed category for Academic WorldQuest for the first time in 2017. 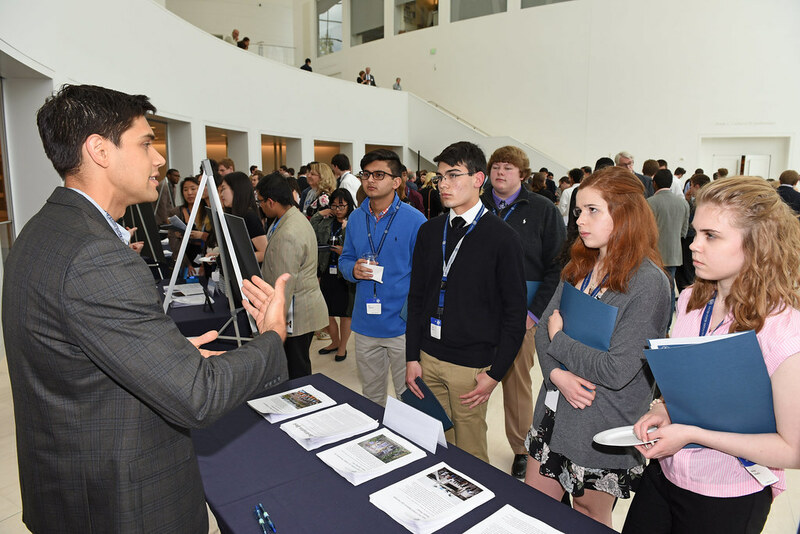 The Institute had the honor of hosting the opening reception for the 2017 national competition on April 28 which brought 250 people from 30 states to our headquarters on the National Mall. The students had an opportunity to explore different elements of the Institute’s work—including work in key countries; the types of training the Global Campus offers; USIP’s relationship with Congress; and more. Our perspective on the world is shaped by what media – and social media – cover. Oftentimes, the headlines are dominated by stories of war, refugees, and extremism. The reality in places like Afghanistan, Iraq, and Colombia is much more complicated. In conflict zones around the world, individuals, communities, and organizations are working to prove that peace is possible when they have the tools and knowledge to resolve disagreements without violence. The United States Institute of Peace (USIP) works to prevent, mitigate, and resolve violent conflict around the world. USIP, created by Congress in 1984, does this by engaging directly in conflict zones and by providing analysis, education, and resources to those working for peace. Are You Smarter Than an Academic WorldQuester?